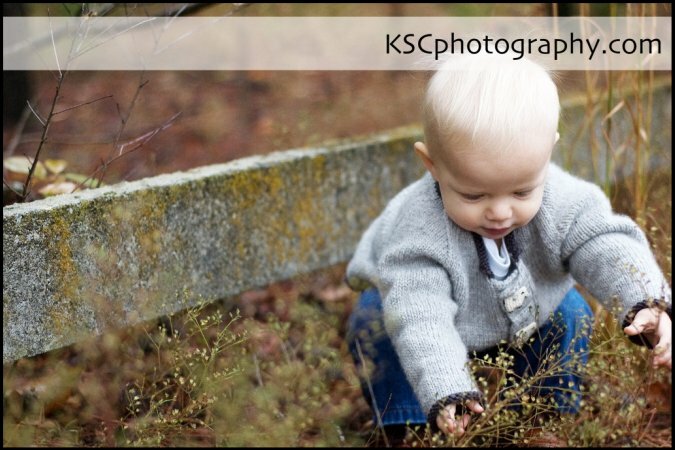 I just couldn't help but share these adorable photos from my talented friend Kate at Tottoppers. Her little boy Charlie is just the cutest and he wears his new "Sheepish" sweater so well! It looks so cozy and warm on him, doesn't it? 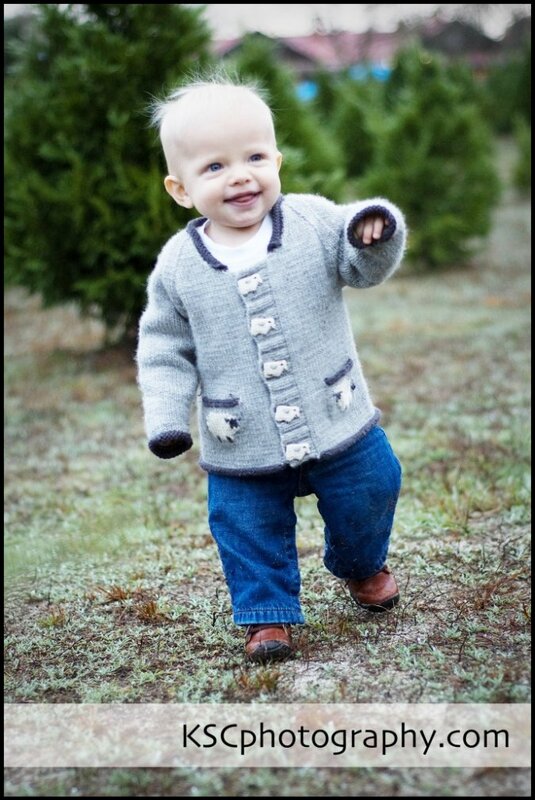 I'm so happy to see that this little sweater works equally well in a little boy's wardrobe. This past August I had the privilege of joining the Spud and Chloe design team! 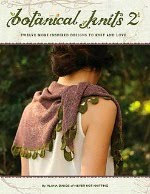 I love working with the Spud and Chloe line of yarns, they are so soft, easy to work with and even machine washable. Perfect for kids! 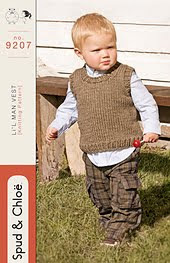 This is the first of my patterns to be released through the Spud and Chloe company. 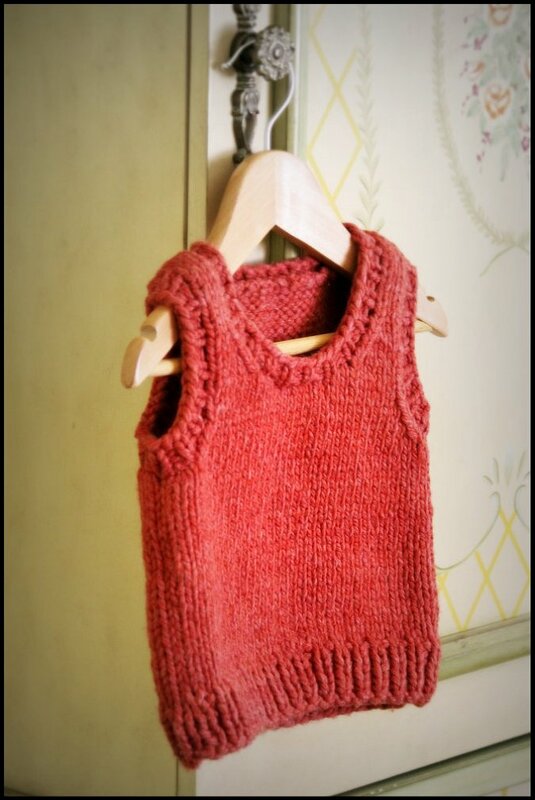 This little bulky vest makes the perfect classic, cozy, last minute gift for the little one in your life. 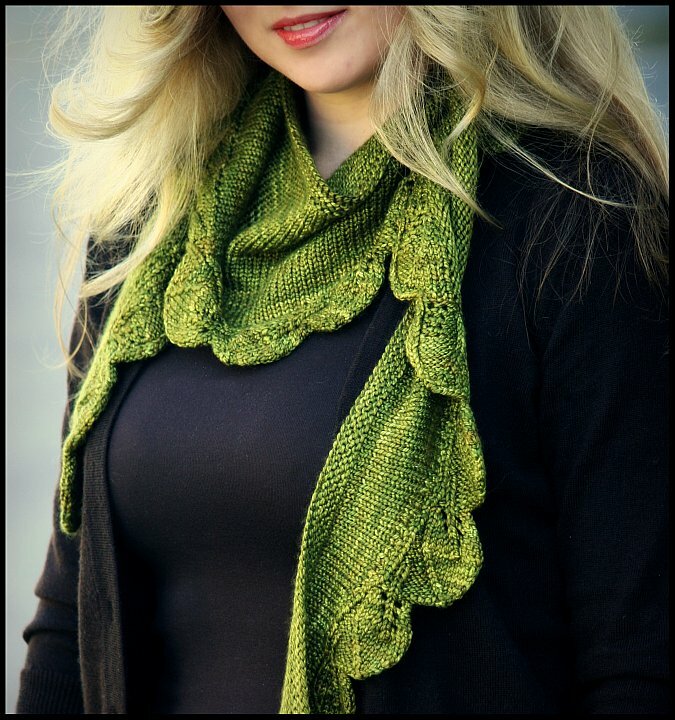 It's knit with 3 skeins of Spud and Chloe Outer on size 10 1/2 needles. 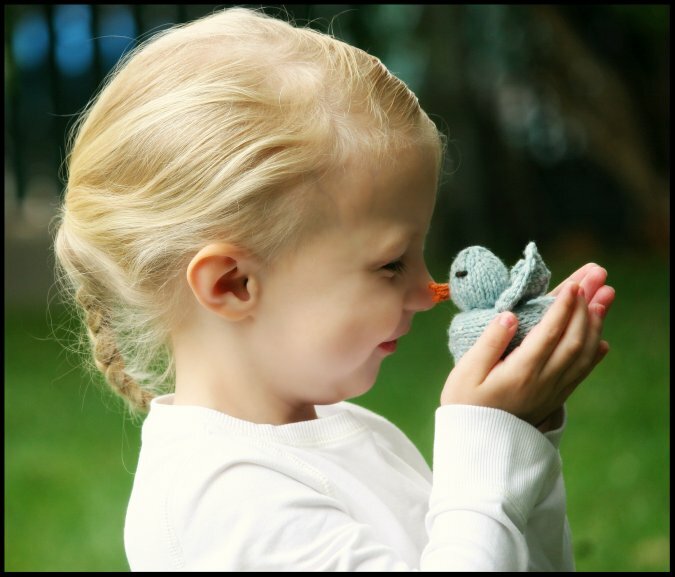 You won't believe how fast this little thing knits up.. Only a few evenings at the most! Spud and Chloe named this pattern the "L'il Man Vest", but I think it can be worn by a girl as well. I've always thought it would look adorable on my daughter paired with a crisp white shirt, a plaid skirt and tights. 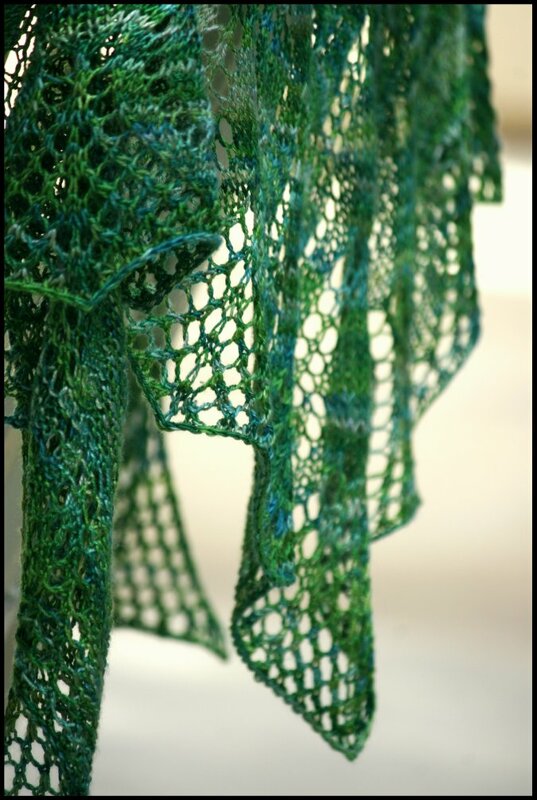 Please leave a comment under this post to enter the Crazy Lace drawing giveaway! 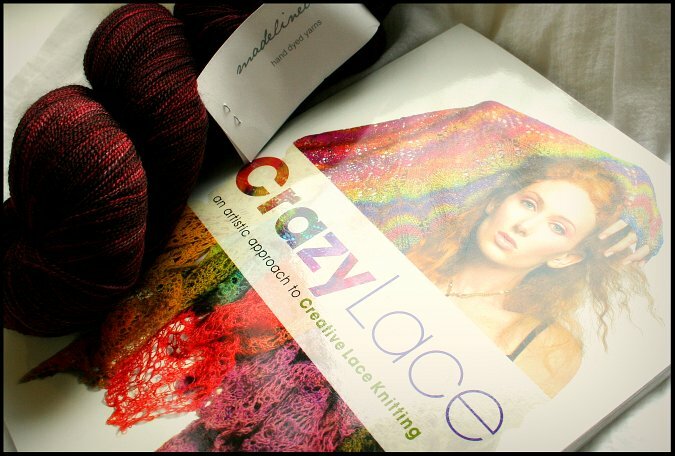 If you are chosen as the winner, you will receive this signed copy of Crazy Lace by Myra Wood. The Backwards Loop to create your own "crazy lace" with. You have until Jan 1, 2010 to enter the drawing! Please check back then to see if you've won! Drawing now closed! Winner is Wooly Knits and Bits! Congratulations! 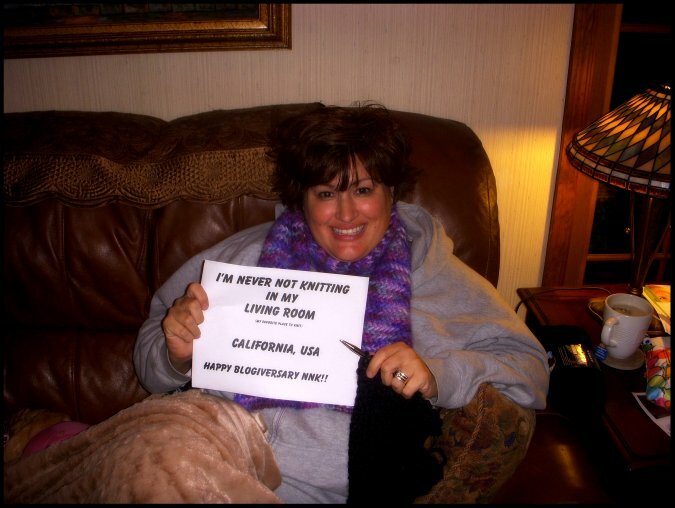 Thank you to all of you who entered my "blogiversary" drawings! 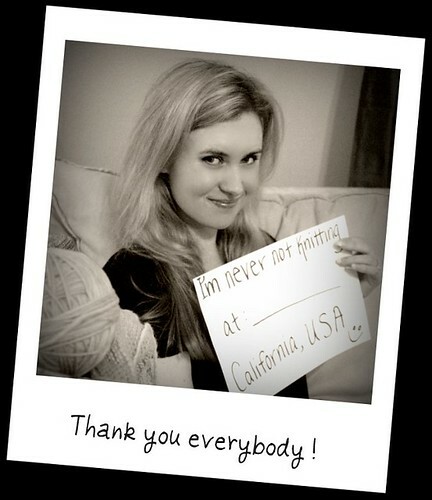 I was delighted to read all of your comments and receive all of your pictures! What fun! who wrote: "I found your blog through your podcast, and I found your podcast through searching iTunes for knitting podcasts! (I listen to quite a few of them and always like to hear a new voice!) I enjoy your reviews and laid back style I've only been a reader/listener recently - but enjoying hearing/reading it!" Congratulations Katerina! 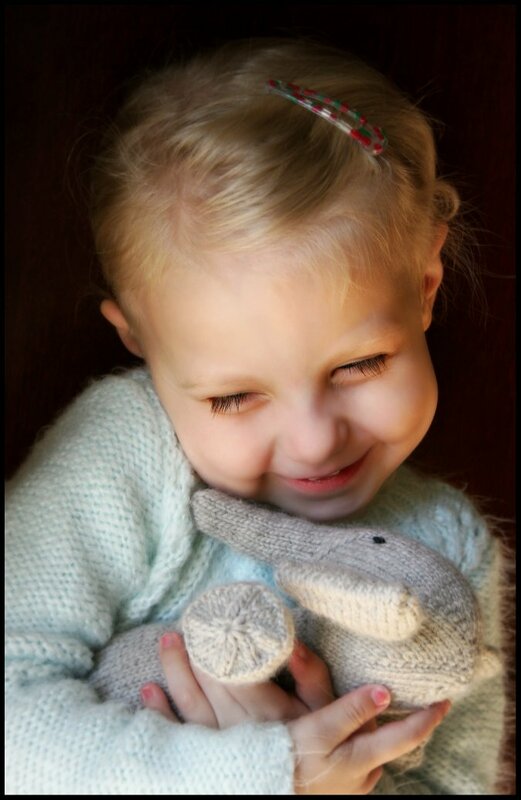 I will be sending some of the NNK patterns, a few skeins of yarn and some treats your way! And now onto Drawing #2! It was great seeing all of your faces and learning more about your favorite knitting spots. Tracy wrote: "Here is my picture for the NNK Drawing. I was going to take a picture of myself at my LYS where I buy most of my yarn and notions, but honestly I love knitting at home after dinner and a long day of teaching. 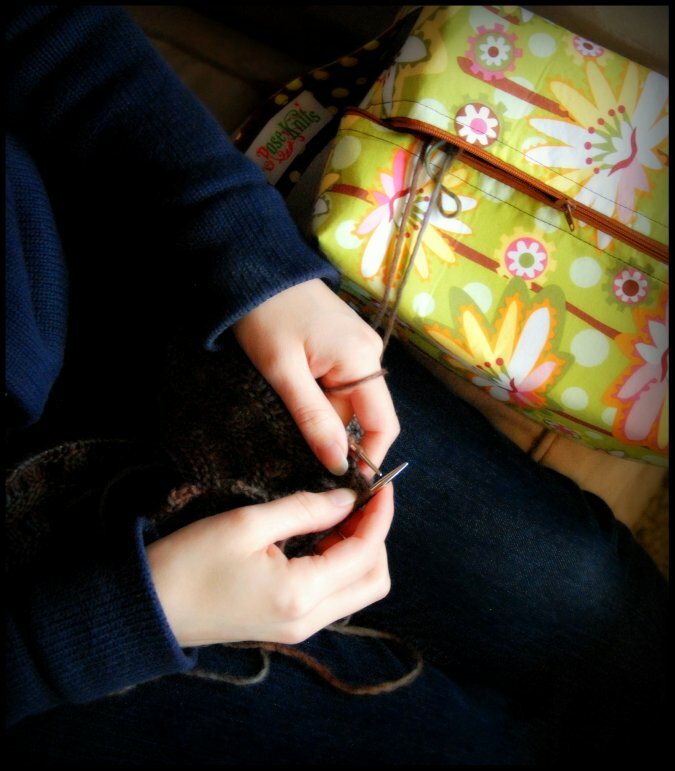 It is a perfect place for me while knitting and spending time with my husband and the other members of our family (dogs: Bandit, and Bailey and our tom cat Winston). " This is what you won! 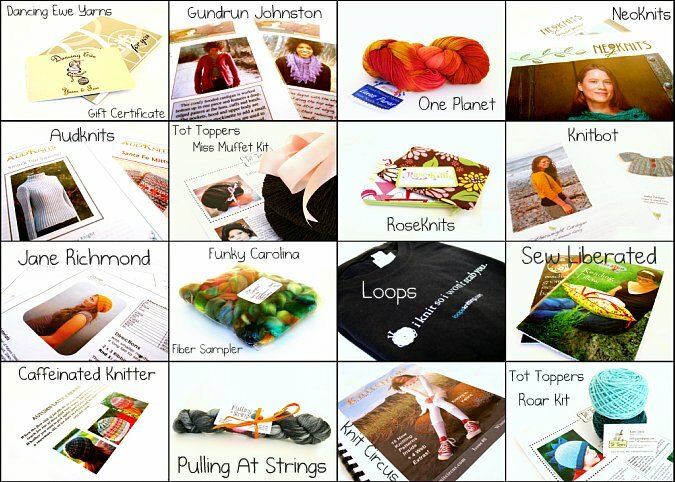 Also included in this prize is a beautiful button selection from Tangled Yarns, (Regrettably the package is being shipped all the way from Australia and didn't make it in time for the photo-shoot) and an ingenious row counter from Pretty Knitty Jewelry! Well I just have to say that this drawing was sooo much fun! I would like to start running drawings like this regularly throughout the year. 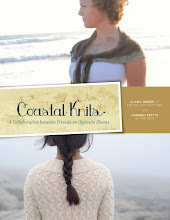 If you would like to be a contributor for an upcoming giveaway please email me: nevernotknitting@gmail.com. Get free shipping through The Backwards Loop until Jan 15th by entering code: “freeship” in the checkout process. 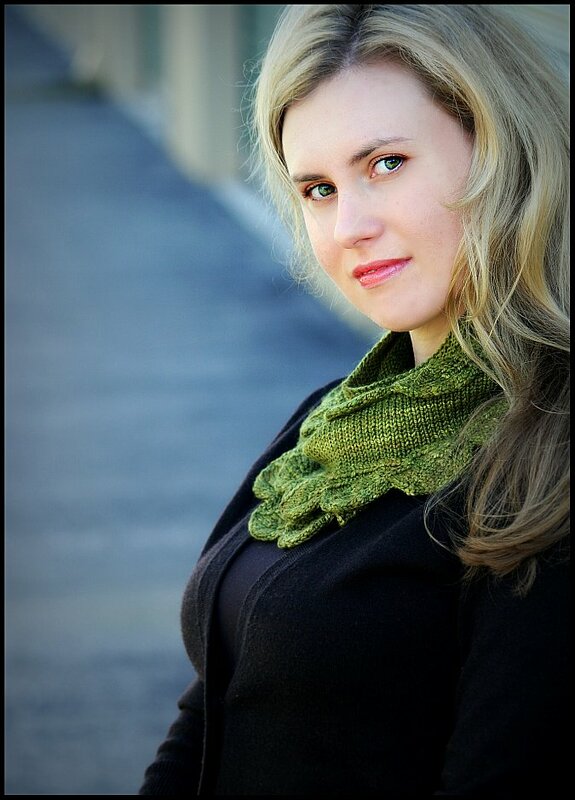 Also be sure to listen to episode 30 to get an alternate discount code for selected Madelinetosh yarns. The special podcast code applies to all yarns with an *. 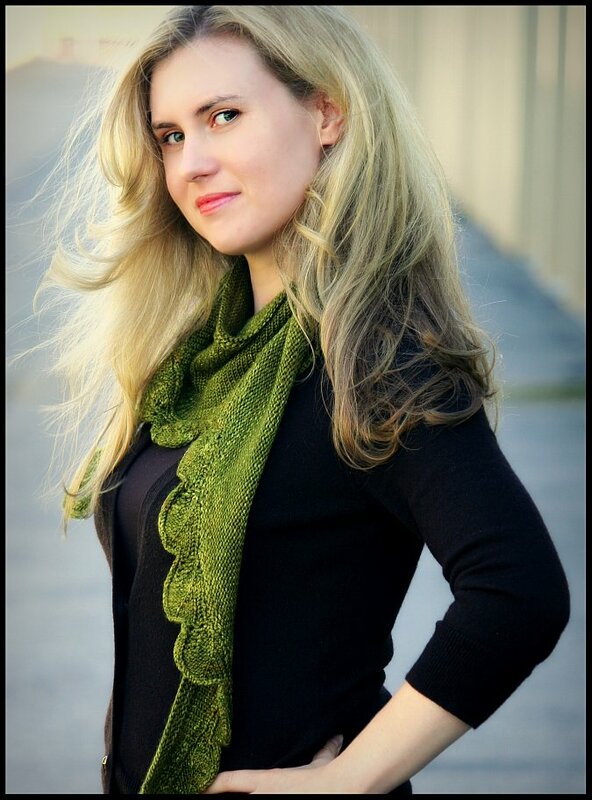 Episode 29 drawing winners: Michelle is the winner of the signed copy of Made In Brooklyn, and Donita won the skein of Classic Elite Princess from Dancing Ewe Yarns! Congratulations! This is the last episode for season 3. Please join me back for Episode 31 on March 1, 2010. I recently fell in love with yet another sweater pattern. 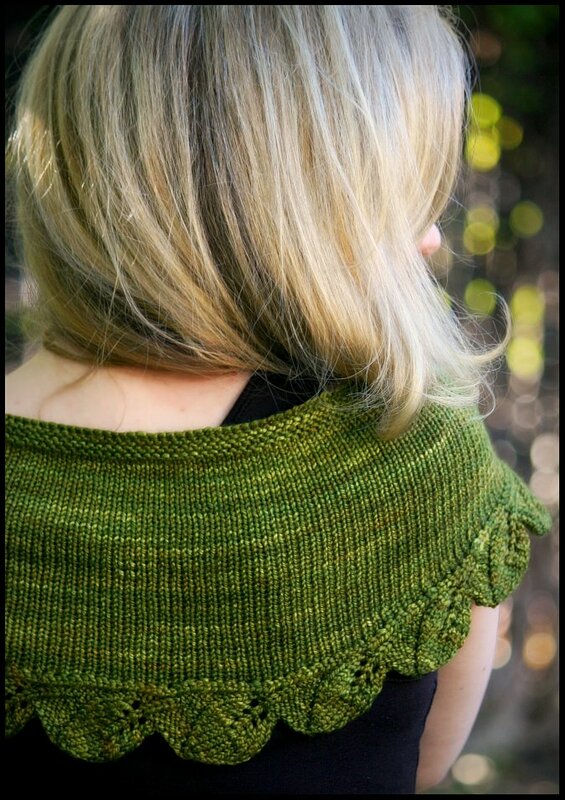 The Tea Leaves Cardigan by madelinetosh. 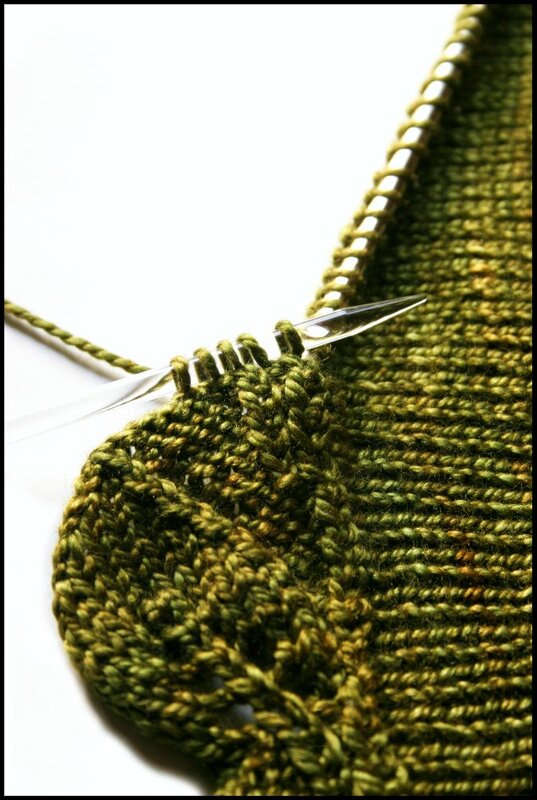 Even though I still have a few projects currently on the needles, I felt the need to cast on for this one right away. Do you blame me? Seriously. Is it just me.. or is this ruched yoke pattern in this colorway of madelinetosh merino pretty much the most beautiful thing ever? I decided that I had to go with the Tannehill colorway for my sweater, just like the original pattern photo. This color intrigued me in the pictures and is equally stunning in real life. Usually I would be scared of so many colors thrown together in one yarn.. but its so elegantly executed. It's truly unique and lovely. (Be sure to listen to Episode 30 of the NeverNotKnitting podcast airing tomorrow. Plus I had to have something exciting and new to put into my new RoseKnits project bag. 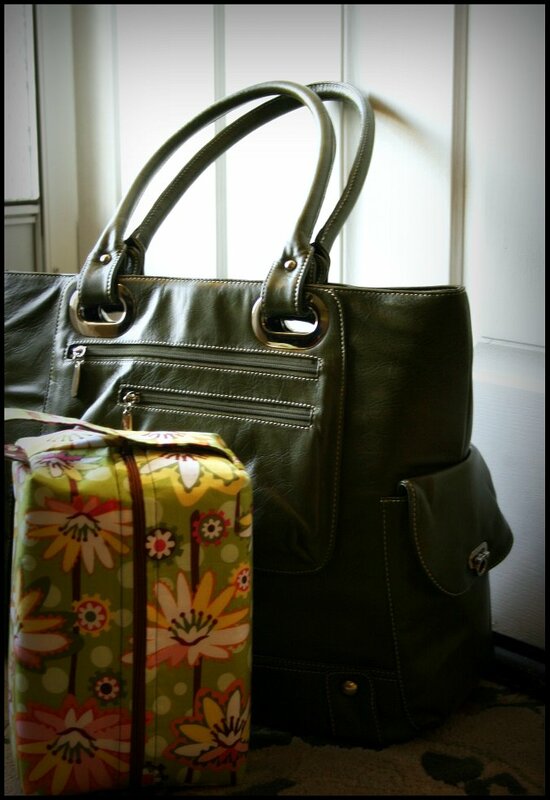 If you aren't familiar with these bags, I highly suggest you check out RoseKnits etsy shop and the selection at Backwards Loop. I am in love with this little bag. 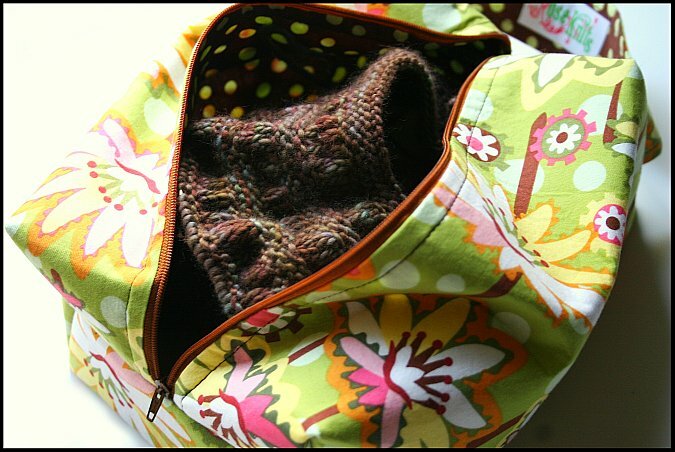 It holds 2 balls of yarn, my work-in-progress and the pattern quite comfortably with room to spare! I also love that it has its own handle! 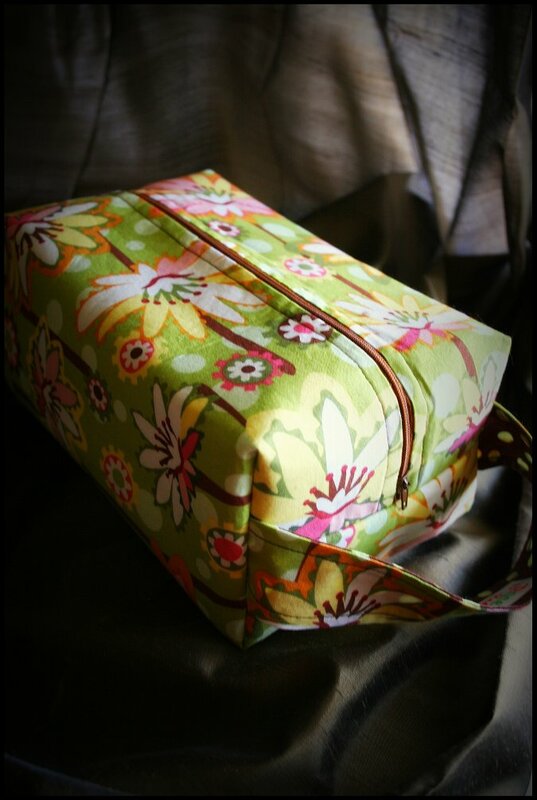 Perfect for knitting on the go! 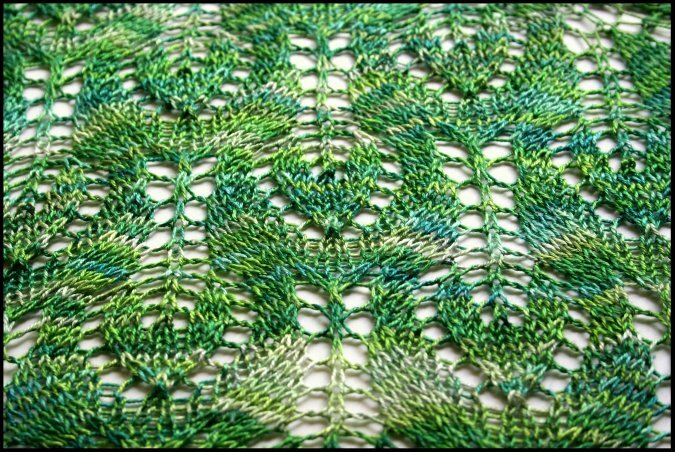 My second Cedar Leaf Shawlette is now finished! I'm so happy to have another in a different color. This one goes perfectly with my winter coat. Also, this will be the sample that travels around in my trunk show. 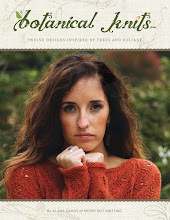 So if your local yarn shop is carrying my patterns, you might get to see this one in person. This was knit from 2 skeins of Malabrigo Silky Merino. I have no idea how I squeezed it out of only 2 skeins! I used the beautiful gray colorway "Smoke". My favorite thing about this pattern is seeing the leaves overlap eachother. so that all the leaves are showing at once. So far this design has proved to be a very wearable knit for me. This is the first scarf I go for in the morning. I hope to make more in different colors soon. Wouldn't it look gorgeous in an autumn colorway? 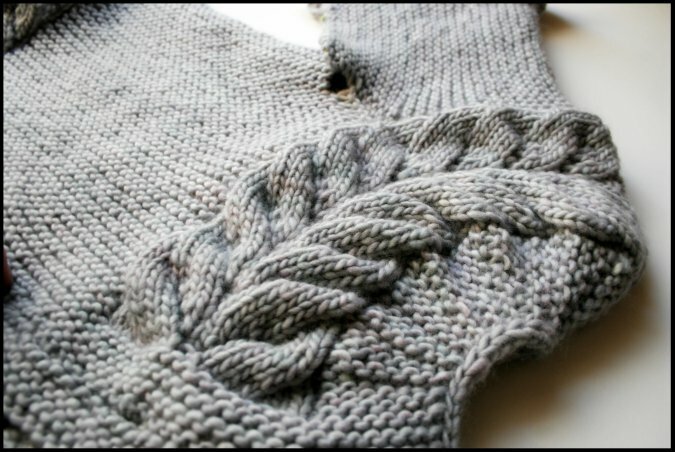 If you are interested in this pattern, I'd love for you to join the Cedar Leaf Knit-a-long. Here is the lovely new hat I just recently completed. 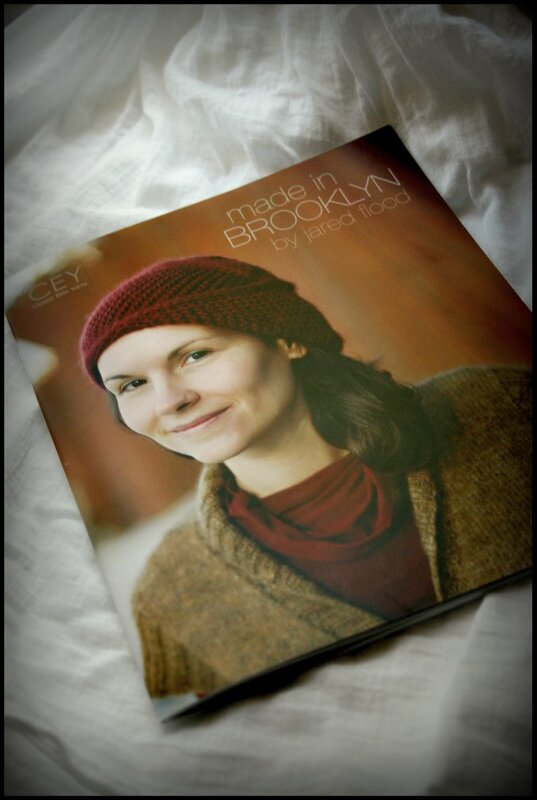 The pattern is named Laurel and it's from Jared Flood's new book Made in Brooklyn. It truly is a stunning pattern isn't it? 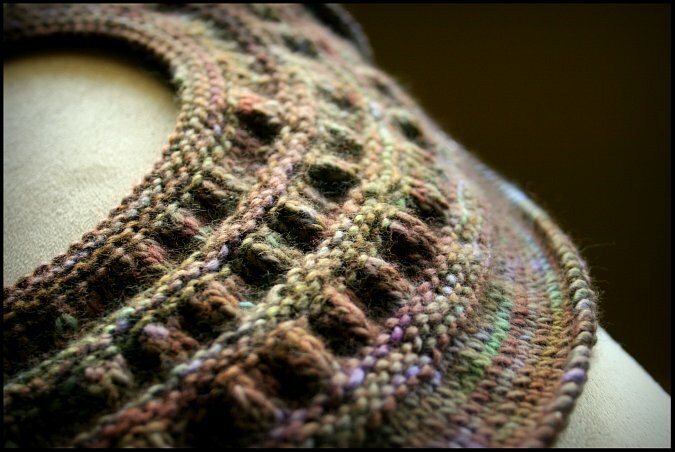 I love how all the cables and bobbles twist together and join into the center of the crown. 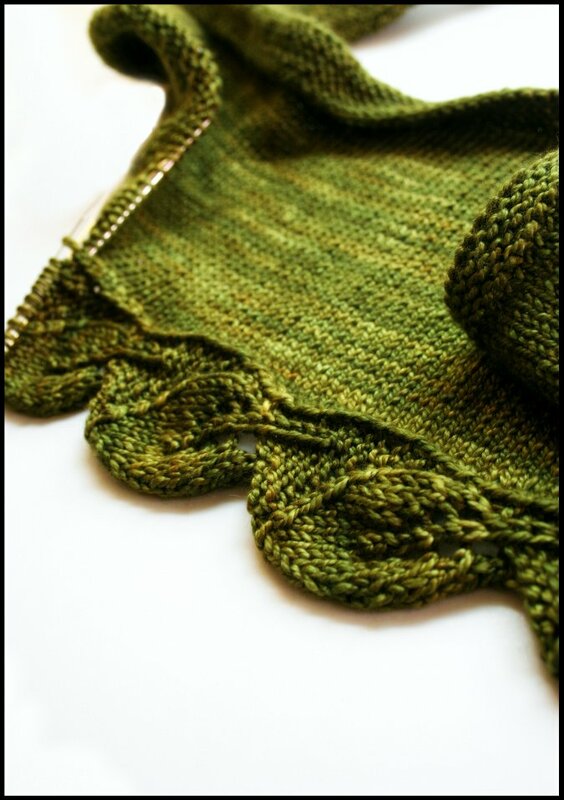 The knitting of Laurel was fun and kept my interest, but was a bit on the tedious side with all of the cable crosses. 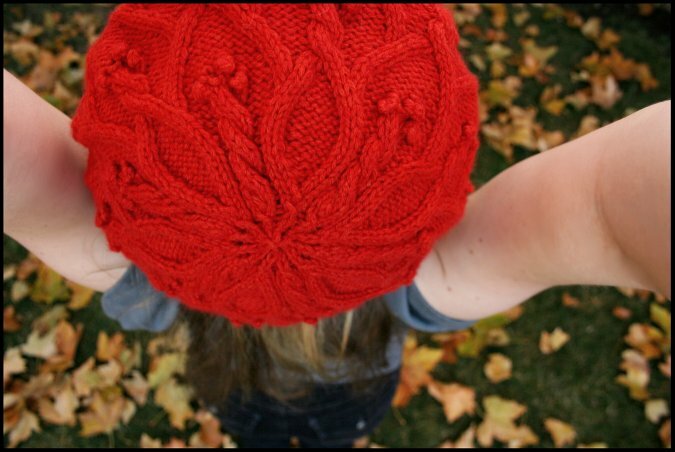 If you are interested in knitting this hat, be sure to take a look at this errata page before starting. Also, I would suggest different bobble instructions than those presented in the book. I found my bobbles to be kind of irregular and puny. I would definitely work them differently if I was to make this again. 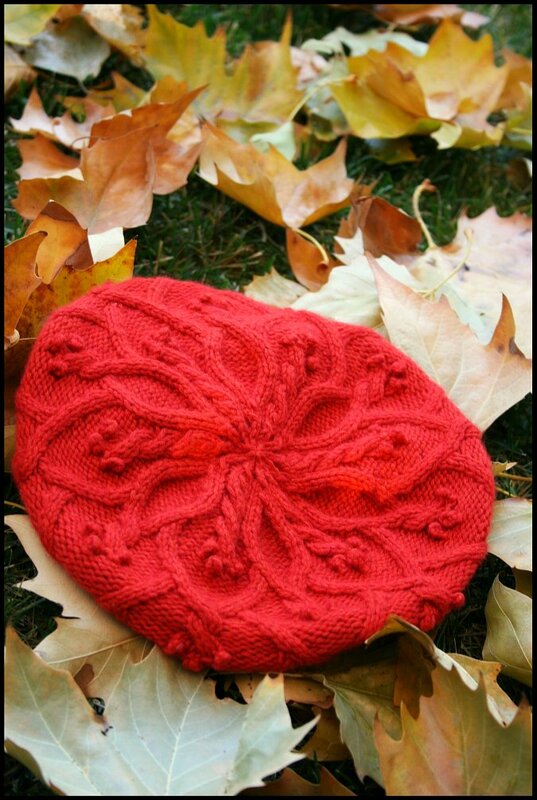 I worked this hat out of the suggested yarn Classic Elite Princess in the Milord's Madder colorway. It's such an ideal Autumn color. The great news is that I made this hat out of only one skein of the Princess yarn! With some to spare even! 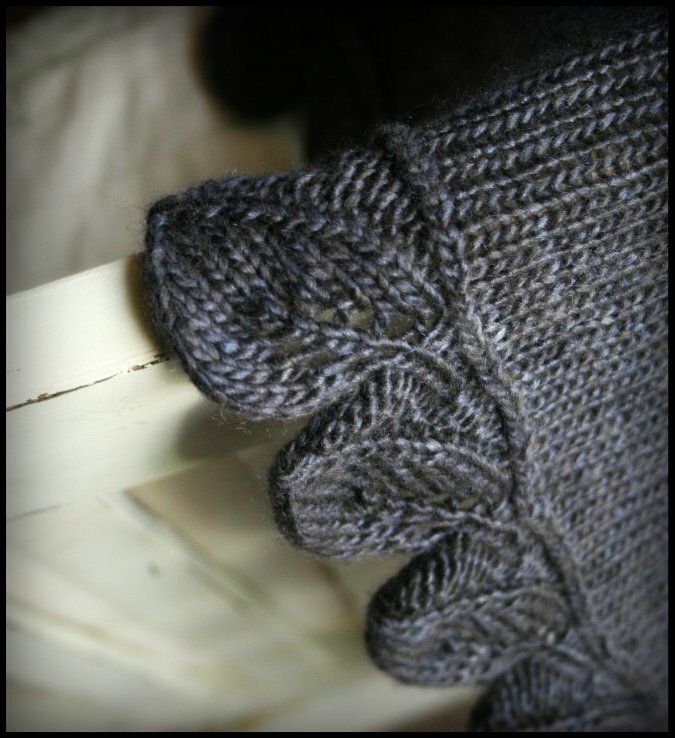 I'm seriously thinking about casting on for the Grove mittens in the same colorway to match! Dancing Ewe Yarns is offering all NeverNotKnitting podcast listeners and blog readers 10% off all Classic Elite Yarns for the month of December 2009. Enter code "NNK1" in the checkout process. Congratulations to bethgormong, the winner of Episode 28's drawing! Click here to download the Mp3 of Episode 29. A lot has been going on around here! squishiest, softest, cuddliest cardigan. I cant wait to wrap myself in it when its done. 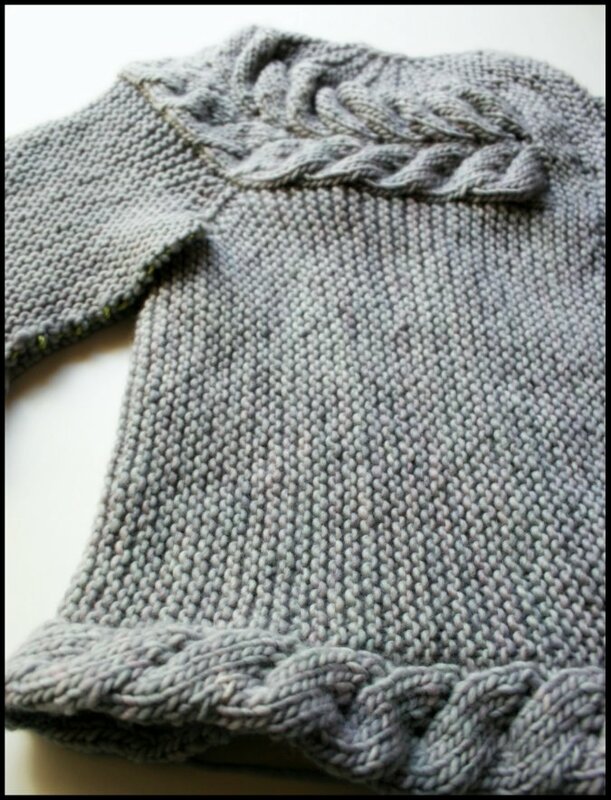 The pattern is Vine Yoke Cardigan by Ysolda Teague. Its a pleasure to knit, but I have to admit that the sweater's current proportions are scaring me a little. Fortunately I know a thing or two about blocking handknits into submission. Also last weekend I had the awesome opportunity of going on a knitting retreat put on by Bonita Knitting and Bobbin's Nest Studio. There was a beautiful boutique set up just for the retreat participants. It wasn't my fault that they happened to include the most beautiful skein of sock yarn in the sale. I had to cast on for Damson straight away. Itty Bitty Toys Drawing Giveaway! 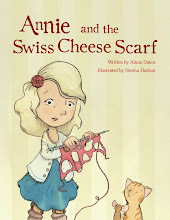 Leave a comment under this blogpost to be entered to win a signed copy of Itty Bitty Toys! You have until November 1 to enter the drawing! The winner will be announced on the podcast and blog, so check back to see if you've won! Drawing now closed! Winner is commenter #230, Louise! Congratulations! Thankyou to everyone for entering! I run drawings on a regular basis, so try again sometime! 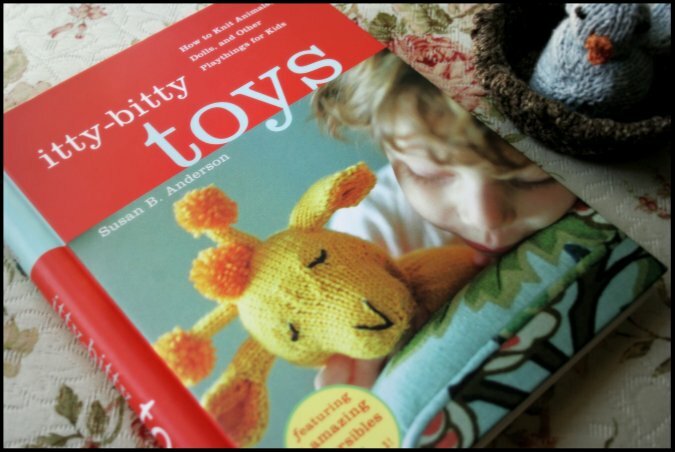 I just knit the most fantastic little toy out of Susan B. Anderson's new book Itty Bitty Toys. 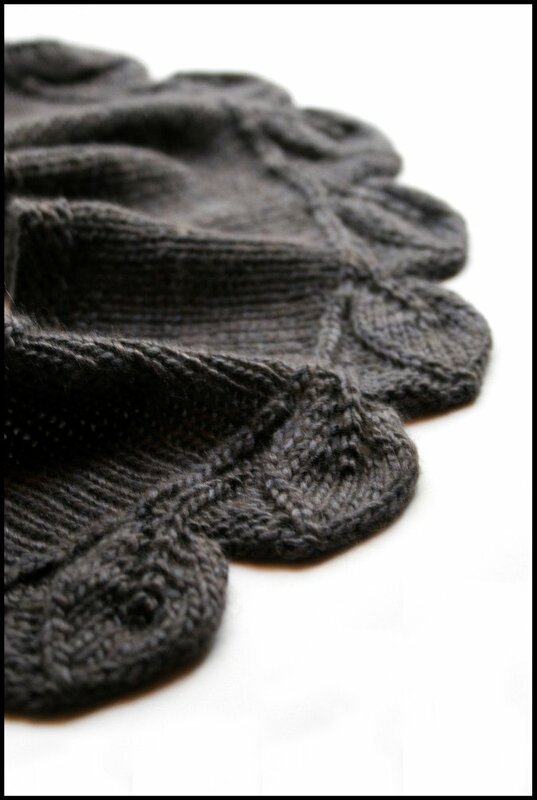 The last chapter contains 5 ingenious reversible patterns, including this one... my favorite. It starts out as a tiny egg and hatches into a sweet little Bluebird. It was so quick! And way easier to construct than I thought it would be. For this project I used 3 skeins of O-wool balance in colors Opal, Natural, and Agate. It only took a tiny amount of each skein. I just used some scraps to make the beak and eyes. There was no way that I was going to order a whole skein just for that! 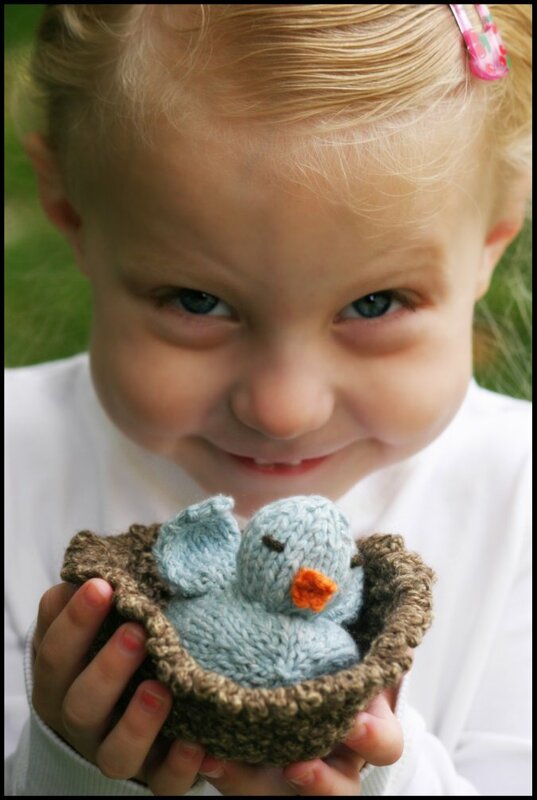 The "Bluebird/Egg" pattern also comes with its own tiny little nest to rest in. So adorable! 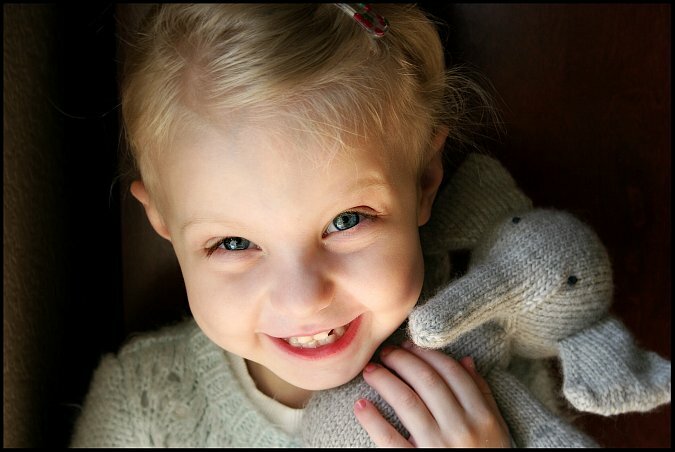 If you would like to hear more about O-wool yarn and the book Itty Bitty Toys, listen to my latest podcast episode #26. 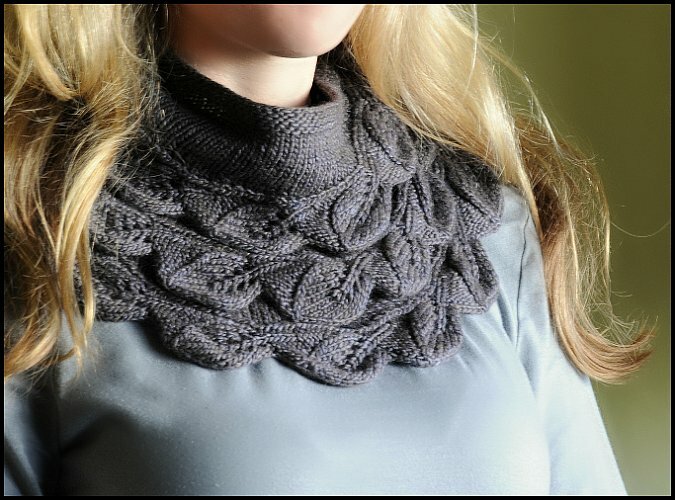 Join the NeverNotKnitting Ravelry Group! Dancing Ewe Yarns is offering all NeverNotKnitting blog readers and podcast listeners 10% of the entire selection of O-wool Balance yarn through November 1, 2009. Click here to download the MP3 of Episode 26. 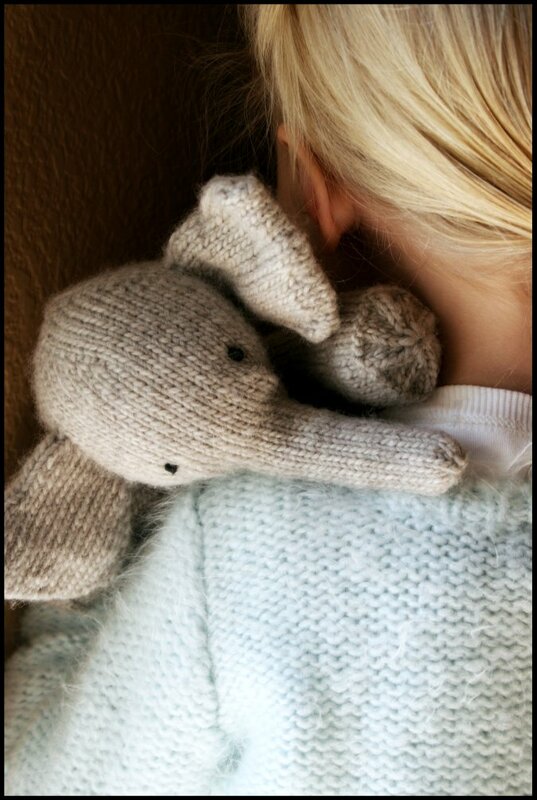 Elijah the knitted elephant has finally been completed. 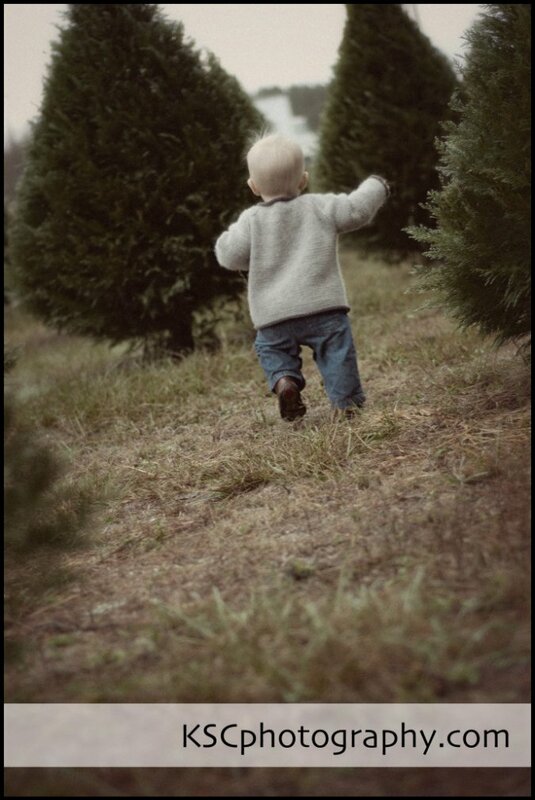 My daughter insists that Elijah is in fact a girl name and is convinced that 'she' is the best thing that ever was. The finished Elijah has proven to be such a soft cuddly companion. Unfortunately I found the knitting part of the project a bit of a pain. 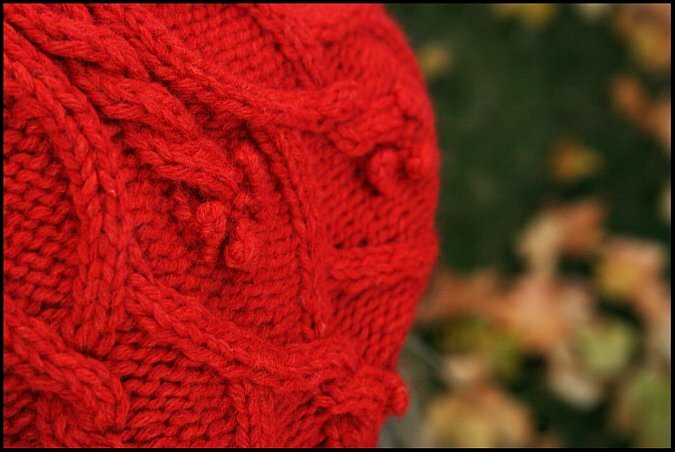 I LOVED the fact that it was knit all in one piece, but at the same time picking up those stitches and knitting at such a tight gauge proved rather cumbersome. I really should have done the body parts in order and worked both ears last. I found it to be quite challenging knitting an arm after an ear. The double pointed needles kept getting caught and it was kind of annoying. I guess that the order of instructions is there for a reason! Oh well.. 'Shes' done now and just way too cute for 'her' own good.. This past week I finished Gail, and rediscovered the magic of blocking. 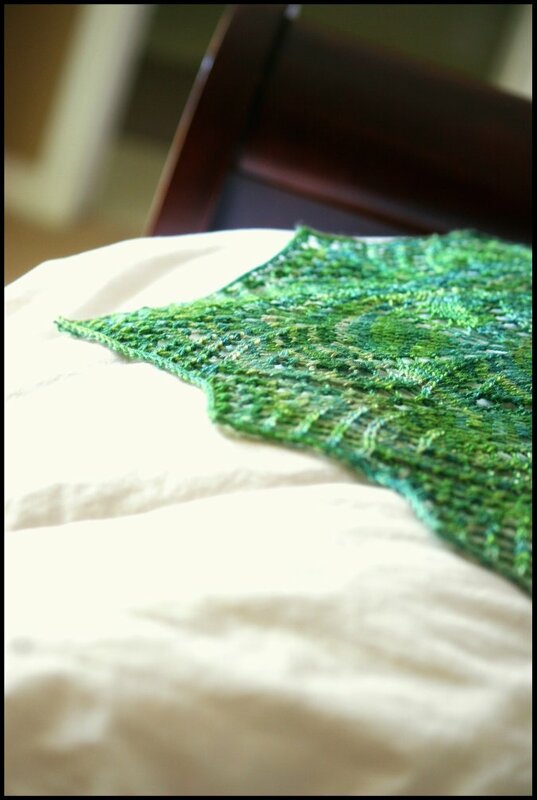 I used one skein Handmaiden SeaSilk in the Ireland colorway and size 7 needles. 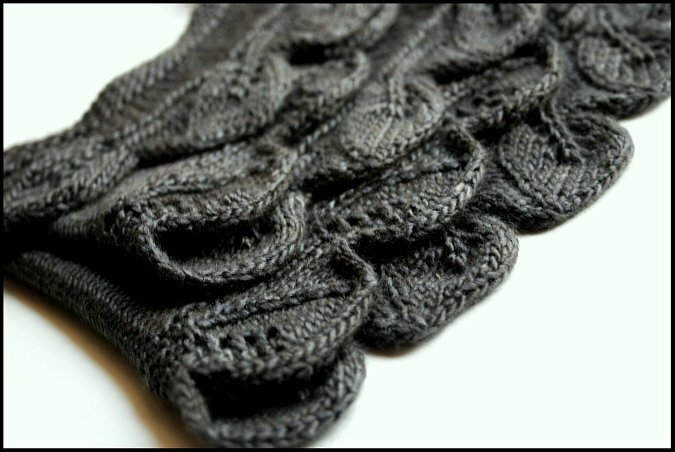 With the help of this chart, this truly was a painless, quick lace project. 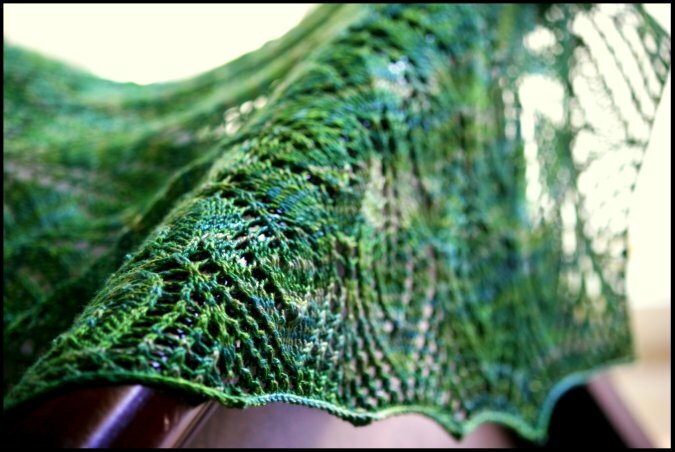 As you know, I'm not a huge fan of variegated yarn, so the Ireland colorway, although beautiful, made me a little nervous. I have to say that I'm quite pleased with the result though. I think that the colors blended nicely and fairly evenly across the piece. 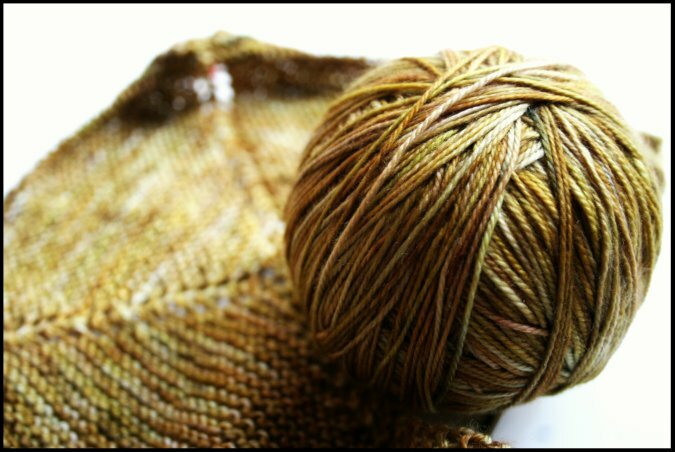 I love the sheen and drape of this gorgeous yarn. I definitely will be working with it again in the future. 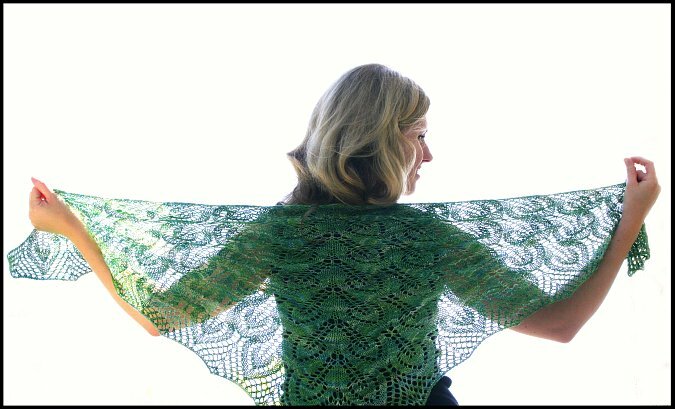 Lace shawls are so addicting! I'm already looking at more patterns!